This sage observation of Edina Monsoon from the tv series Absolutely Fabulous never rings truer than when applied to gardens. I was reminded of this recently when I stopped by Brookwood, one of my favorite “secret gardens” I visit regularly.Gate in which one would enter the garden coming from the house It is located on the western shore of Otsego lake, just north of the village of Cooperstown, NY. This quiet haven is separated only a mile or two geographically, but a world away psychologically from the baseball bustle and summer throngs on the village’s main street. Brookwood is one of the oldest estates on Otsego Lake. The core of the present house on the site, engulfed in later additions, pre-dates 1820. The property was associated with several well-known local families before being purchased as a summer home by James B Jermain of Albany NY. His granddaughter Katharine Jermain Savage, who inherited the estate in 1897, and her husband Frederick dePeyster Townsend, a landscape architect from Buffalo created the gardens we see today. The garden and garden house were designed and built by Frederick and Katharine from 1915 to 1920, who deftly incorporated formal elements with the natural landscape. 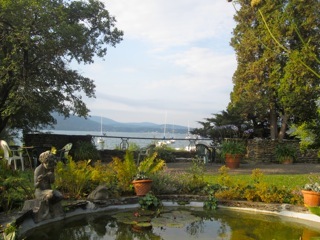 The parterres, statuary, fountains, and stonewalls, which serve to anchor the different areas of the garden seem as if they were always meant to be there, as much as the woods they lead one to, or the views of the lake and hills beyond which they frame. The stone steps and gravel paths connect the different levels and areas of the garden without creating an obvious one-way traffic flow, encouraging the exploration of all the corners of the garden without feeling like you must take the same route every time. The day I stopped by I ran into Pat Thorpe, a volunteer (who possesses some admirable cheekbones herself) I have associated with the gardens ever since I started visiting them over a decade ago. She heads the efforts to keep them maintained, which she does sublimely. The plants are not a “tour de force” of exotic varieties, nor are pristinely spaced and pruned, but exist in natural looking soft borders, mixed with ancient shrubs and an apple tree. I am not sure how many of the types of flowers that we see today are the same as those that were growing there a hundred years ago, but the heirloom varieties and mature groups of plants certainly lend that appearance. The billowy stands of blooms serve as natural foils for the more formal architectural elements of the place. One on the things I also love about Brookwood is how it differs from many of the other gardens from that era now open to the public. Many of garden’s surviving contemporaries were created by famous landscape architects for their very wealthy clients, who maintained them with armies of gardeners. This is a rare surviving example of grounds designed and developed by an avid gardener and a landscape architect for their own home. Resulting in an expression of their taste and ideas applied on a more manageable scale than many gilded age gardens plunked down in a landscape. Although I am sure there was a servant (or two) around the place to help them, it has the look and feel of a garden I might have designed for myself, if I had the proper training. And talent. And vision. The garden house is a vaguely Japaneses inspired structure, which served as a classroom for the children (whose names are inscribed in the hearth, a favorite retreat and the scene for dramatic presentations authored by Katharine, some of which are still preserved in the Garden House. The Property is open daily to the public free of charge. The address is 6000 State Route 80. Cooperstown, NY 13326. It is located about 2 miles north of the village, and the entrance is on the right hand side of the road (discretely marked and easy to miss, so keep an eye out for it). You can also visit the Otsego County Land Trusts's website for information on activities and special events held there.